A couple years ago, something like one day after David and I had a discussion about me needing to reduce the number of foster rabbits in my house, he arrived saying he saw a stray bunny in my neighborhood and we needed to go catch it. Catch it we did that night in someone’s yard, and I let him name her. David called her Eponine for the tragic character in Les Mis, and so far I guess that’s the weirdest foster rabbit name we’ve had! Eponine had been adopted once but returned for being a little feisty, and landed back at our house recently. 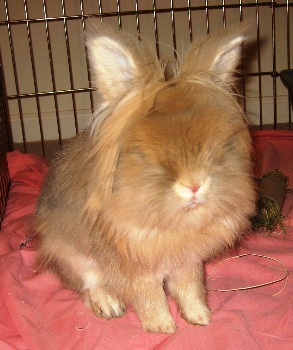 I don’t think she liked me a whole lot, but she was a cool bunny and loved to come see what we were up to. 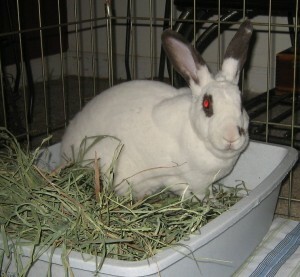 Well, today she was adopted to be a friend to a big bun named Victor, who had also started out as a stray! 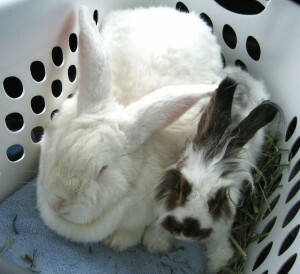 Long-time foster Arwen also found a home as a friend to a three-legged mini-Rex. 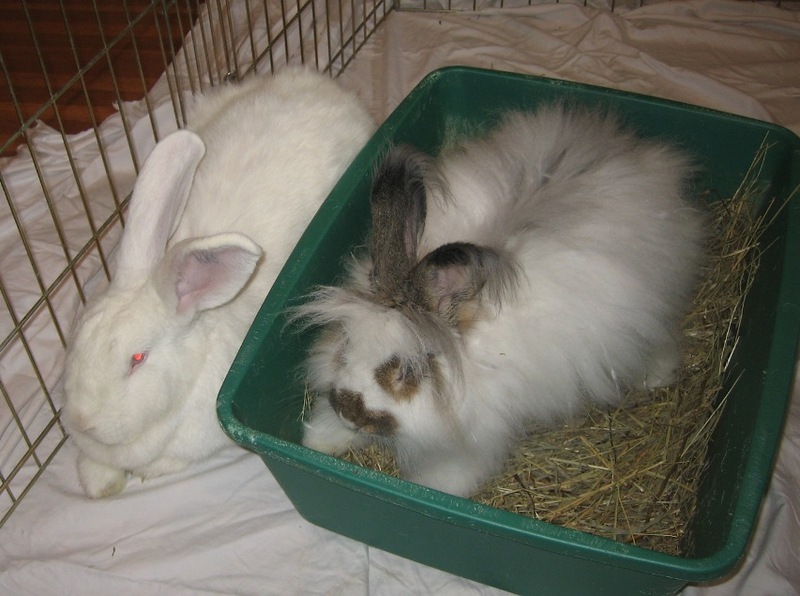 There were at least eight single girls there looking for new homes, plus another five or so rabbits in the house, meaning most of the rescue was in the same place at one time. 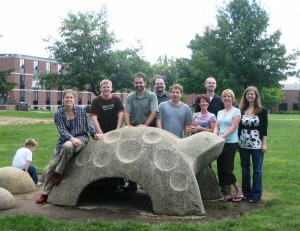 Thanks to Amanda for hosting! Olive won for funniest hair. 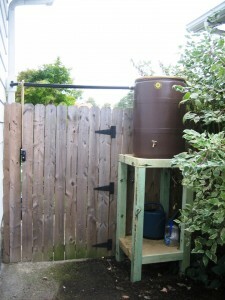 Because David does everything with flair, as I often say, I give you: the rain barrel. I don’t think the neighbors knew what they were agreeing to when he asked if he could install the barrel between our homes. Their large bush obscures it well enough from the street, and the goal was to share the water with them (they garden much more than we do and have many beautiful flowers). They’ve taken to calling it the Water Tower and singing of Petticoat Junction girls. We did finally have rain today and it works! There is room for a second barrel beneath the first one and the stand would survive a tornado. After a lesson wearing the harness in the house, and a lesson going on a walk with the harness, today Walter tried the harness attached to the WalkyDog on the bike. 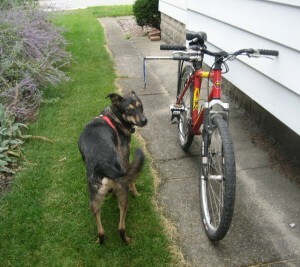 I walked the bike several blocks with him in a fine drizzle, and we’ll have to practice more because he wants to pull. At least he’s no longer afraid of the bike! We had the most success while going quickly and as far from the curb as practical, because then he’s focusing on trotting and not sniffing the gutter. I guess that’s good once we get going but I haven’t tried riding with him yet! Just caught Casper snoozing, my fluffy nut who can’t be brought inside from the yard these days without a cookie bribe because she’s too busy eating tomatoes. Now the dogs are wrestling and nibbling each other on that bed. 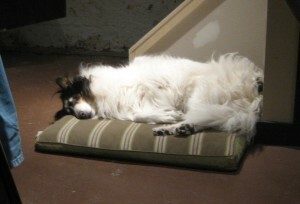 Their best performances this weekend were Casper barking at an email inbox chime she thought was the doorbell (Walter is bright enough to know better) and Walter being scared of David, who came home from a wedding last night in a tux. He had to strip to underwear before Walter stopped hiding behind me and ran to meet him! Let’s just say I’m a bit frustrated with the insurance experience (or lack thereof) to date. I am trying to be compensated for my bike, which was smushed by a car over three weeks ago. The frame is bent and cannot be repaired, and other components have been damaged as well. My last actual contact with the adjuster was over two weeks ago, and she hasn’t returned/acknowledged the four voice mails, two faxes, nor one email I’ve sent since then to check on the progress and to supply the necessary estimate/receipts. Last week I asked to speak to ANY adjuster at the insurance company and she was able to see that my adjuster had spoken with the driver, but other than that there was no activity since I talked to her (and no indication of receipt of the paperwork or messages I’ve left). I just want to know the progress; the season for enjoying my bike will end soon and I would like to know how this process is going to work. Will I get a check? I want to just buy another damn bike, but I don’t know if payment must be made to a bike shop (and therefore I have to arrange for a refund of my money once that arrives, if the shop will do it) or if it even has to be purchased from the shop that did the estimate (I sure hope not; I don’t care for that shop but they did service my last brand of bike so I had to see them for the replacement cost info), and because of the uncertainty of this payment I can’t go to a distant shop nor order online or buy from Craigslist. Meanwhile I don’t know if the insurance company will salvage my bike, and if so, I need to remove several accessories that are not part of the original build/damage report to be transferred to a new bike. Meanwhile I’ve searched locally, and come up almost empty. 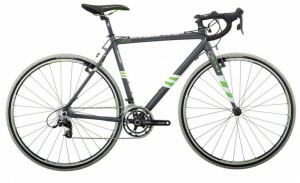 Cross bikes don’t sell well here, so the couple that are left are not my size and are last year’s model (can’t be ordered in other sizes), and new models aren’t expected to come in since they are hard to sell and old models must be cleared first. Even if the shop chooses to order more it could be several weeks. 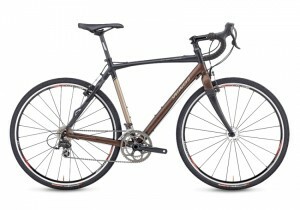 I rode two bikes (old model, wrong size) and have to decide what I can from that. 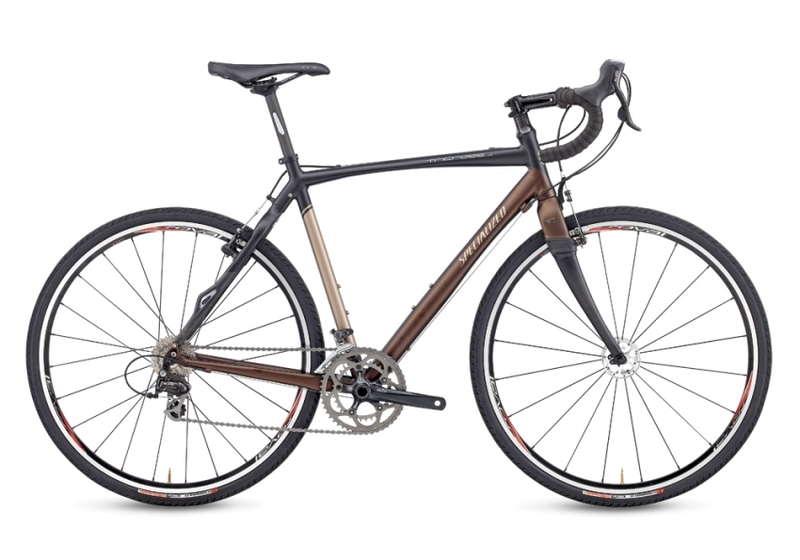 Half the cross bikes don’t even come with rack mount options so that reduces choices from many major manufacturers (the ones most likely to be stocked in a local store). I’ve considered a custom build but that takes awhile, too, and gives me fewer options in frame appearance as well as that not-ridden-yet uncertainty. The first one is quite a bit more expensive, apparently because the manufacturer bankrolls racing teams and has other marketing expenses. The second one is much more of a value, but has less ‘street cred,’ yet great components for the most part. I like the paint job on the second one better but there’s a rumor it’s sold out and I sure haven’t ridden it nor even anything else from that manufacturer. I did ride a modified version of the first bike at one shop (only because one of the employees had his own!) and liked it a lot, plus it’s the step up from the other model I really liked last year when I chose the Bianchi instead. If both bikes were side by side and rode the same, I’d get the Raleigh. But without riding one… wow, that’s a gamble. Meanwhile I ordered a WalkyDog to take Walter with me on a bike ride. I pulled out the old mountain bike (lots of bunny fur in the chain since I stored it in the bunny room!) 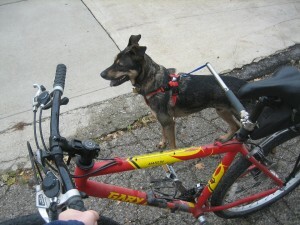 and now that I’ve gotten him used to his new harness, it’s time to try attaching him to the bike. He has picked up on ‘left’ (not ‘right’ yet so much) just while walking and with my stable old bike and a slow speed, I think we can give it a try. I think he’d love to go for a run and I just can’t walk long enough to tire him, so hopefully we won’t crash and regret the dog+bike attempt! Nicole and I (with Ainsley and Walter) checked out the new open portion of the Pennsy Trail last week and since it’s so straight, level, and sparsely used, it may be a good spot to try a dog with a bike. 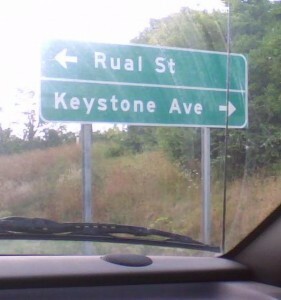 Coming in as my second favorite typo so far, I give you: The I-70 ramp to RURAL Street. 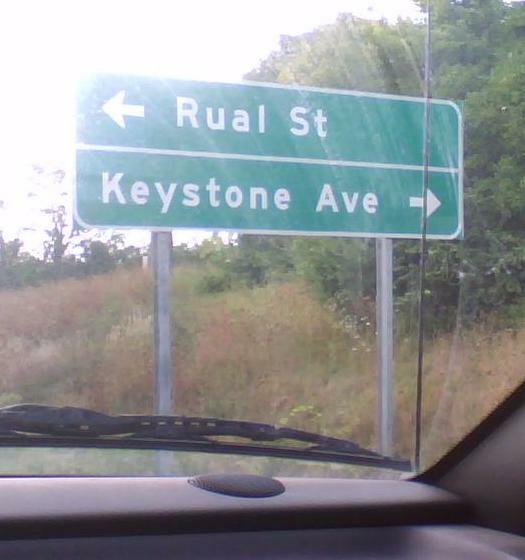 Ironically named since this street is in a gritty urban area, now I have a reason to pull off the road to take a picture and risk carjacking. 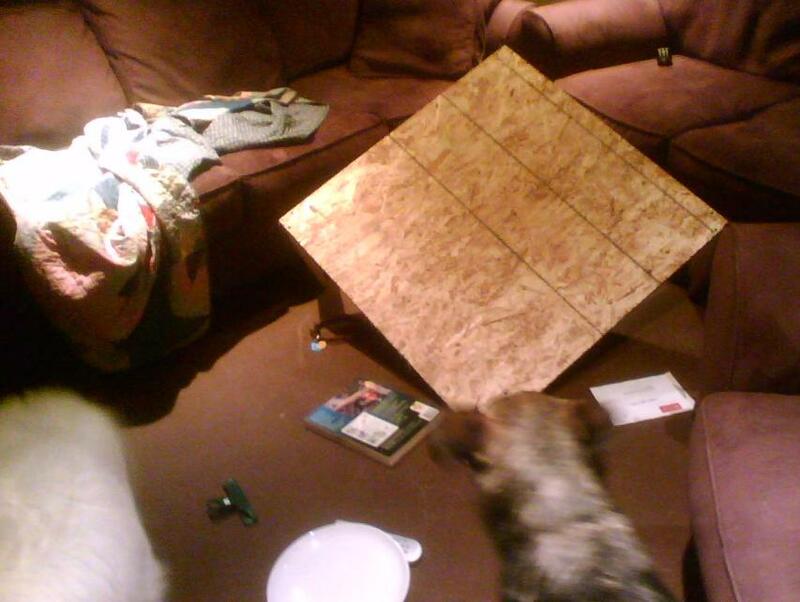 Meanwhile David’s prototype coffee table bit the dust when he sat on it. All the items on the floor used to be on the table. Watching him land was hilarious. I should note that it was a prototype for size and shape, not construction quality. Who wants to do the Tour de Cookie?? I need to get my bike replaced! COOKIES!